March Challenge - What Are Your Top Ten? For the March Book of Me Scrapbook Layouts Challenge we'll concentrate on Layouts with lists. The options say "Ten", but maybe you can only think of 5 - or may be your imagination is really active and you can think of 20. Pick your own number. You are not locked into 10! Option #1 - TEN THINGS I LOVE - Dark chocolate, the TV show "NCIS," Scrapbooking, and traveling are just a few of the things I love. Change the number if you want, but make a layout that incorporates a list of your favorite things. Photo and Scrapbook layout ideas: Of course photos of your faves! 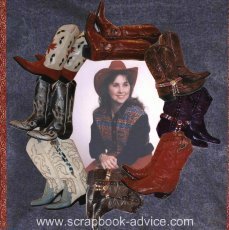 It seems that one of her favorite things is cowboy boots so it's in her Book of Me Scrapbook Layouts. Using photos of some of her boots, the photos were cropped and arranged into a frame around the central photo. Just another way to use creative Scrapbook Photo Cropping. Option #2 - TEN WAYS TO MAKE ME SMILE - I would be absolutely thrilled if someone (anyone!) washed and vacuumed my car for me. (I used to have a friend that would do that for me and somewhere there is a photo, but I can't find it.) Or asked me about my day and actually listened to my reply. Those are two things that would make me smile and I'm sure each of us can think of at least 10 things to go on this list. Scrapbook Layout Ideas: Alternate Scrapbook Titles could be "Ten Ways to Make Me Happy" or "Ten Ways to Make My Day." Hey, maybe this page will move those that love you to try to make you smile! You do show off your pages don’t you - that’s the point of the Book-of-Me, isn’t it? Option #3 - TEN THINGS I LIKE ABOUT ME - What do you like about yourself? What personality traits are you glad you have? This one might take some thought. Try asking someone else what he/she likes about you and that might get the ball rolling. These personality traits could be your Scrapbook Titles.